Sometimes pedal power just isn’t enough, which has led to various attempts at adding extra oomph to the relatively low, if efficient, power output achieved with human muscle and chains and sprockets. Some efforts, a two-stroke petrol engine or an electric motor for example, are effective and sensible solutions. Others are basically bonkers. 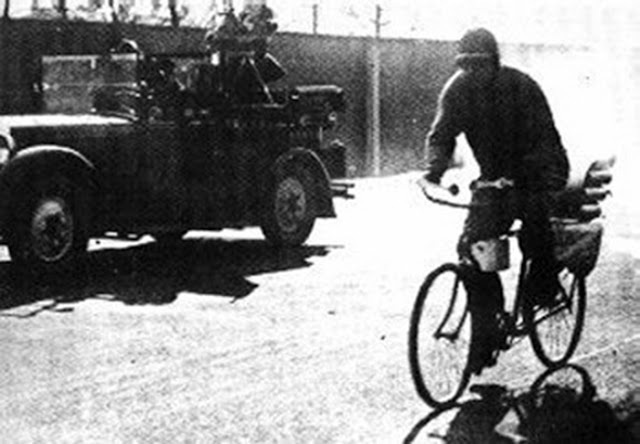 Enter German engineer, Herr Richter, with his raketenrad, or rocket-bike, in March 1931. 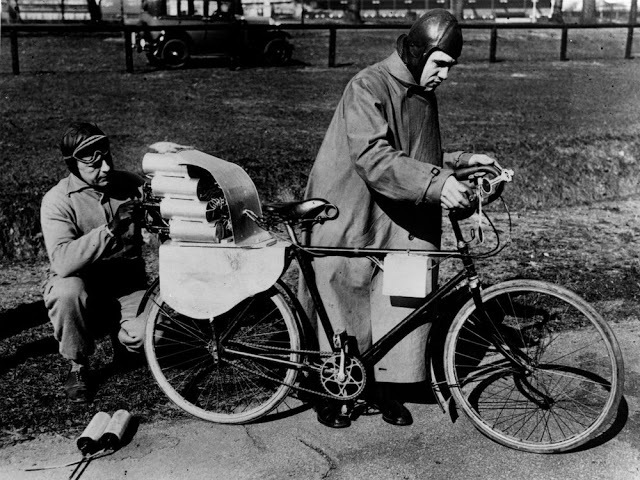 24th March 1931: German engineer Richter with his assistant adjusting the rockets on his cycle before a test drive. With twelve black powder solid fuel rockets attached to the rear of his bicycle and a battery hanging from the top tube acting as the ignition system, Richter set off down the Avus race track in Berlin reportedly reaching a top speed of 55 miles per hour before losing control and being thrown from the bicycle. Herr Richter on his rocket propelled bike. Luckily he escaped unscathed, ending up in a track-side ditch before cautiously approaching the potentially explosive and now stationary bicycle. Richter wasn’t the first to fit rockets to a bicycle and he wasn’t the last. In November 2014 François Gissy set a new world record by reaching 207 miles per hour on a hydrogen peroxide fuelled rocket bike designed by Arnold Neracher. On one run Gissy trounced a Ferrari F430 Scudiera. Of course rocket-bikes are practically useless as a means of transport but like every experiment that pushes the envelope of design there’s always a chance that something that does have an everyday use will come out of it. It also gives me an opportunity to link to ‘Rocket Man’. Take it away Elton. 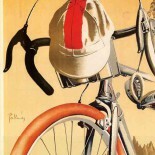 This entry was posted on December 17, 2015 by aaroncripps in Cycling, Cycling Shorts, Cycling Tech, Germany, Great Rides, History, People and tagged Cycling, Cycling History, Herr Richter, Raketenad, Rocket Bicycle, Rocket Bike.